Indian Coast Guard Recruitment 2018 For Posts of Assistant Commandants @joinindiancoastguard.gov.in : Indian Coast Guard has released a notification for the recruitment of Assistant Commandants in General Duty, General Duty (Pilot) and Commercial Pilot (CPL). Interested candidates may check the vacancy details and apply online from 19-05-2018 to 01-06-2018. • Candidates should have passed Bachelor's Degree with 60% in aggregate from a recognised university. • Candidates should have passed Mathematics and Physics as subjects up to Intermediate or Class XII of 10+2+3 scheme of education or equivalent with 60% aggregate in Mathematics and Physics. • Candidates should have passed 10+2 with 60% in aggregate from a recognised board and musty posses current/valid Commercial Pilot License (CPL) issued/validated by DGCA on the date of submission of application. Selection of candidates will be made on the basis of Preliminary Examination, Physical Fitness Test and Medical Examination. 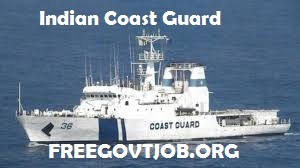 Interested and eligible candidates may apply online through Indian Coast Guard website - http://www.joinindiancoastguard.gov.in/ - from 19-05-2018 to 01-06-2018.